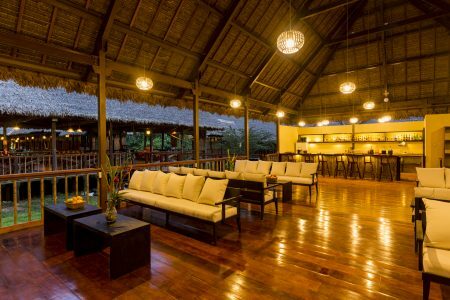 Tambopata Research Center is the most remote jungle lodge in the Amazon. There are no humans nearby so sightings of monkeys, macaws and other large species become more frequent. Last year, 24% of our guests saw jaguar at TRC! Tambopata Research Center is an excellent headquarters for in-depth explorations of Amazonian nature and wildlife because of its remote location in uninhabited wilderness housing stable populations of endangered wildlife, the small scale of its infrastructure and operations and the presence of researchers and naturalist guides. Day 1 Arrival in Puerto Maldonado and transfer to Tambopata Research Center. Day 4 Departure – Transfer from Tambopata Research Center to Puerto Maldonado Airport: land and river transportation. Day 1 – Arrival in Puerto Maldonado and transfer to Tambopata Research Center. You will take a short ride to our operations office in Puerto Maldonado where we will ask you to store luggage you won’t need in the following days. Luggage is hand-carried at various stages in the trip for long distance so we ask you to please limit your weight to 15 kilos (32 pounds apiece). We recommend you to pack separate bags and safely leave them at our storage in Puerto Maldonado on the first day so we won’t be carrying them around uselessly. Your bag will be waiting for you at the airport the day you leave. After taking care of luggage, we take a 40-minute drive to the Infierno Community Port where we board long, sturdy canoes equipped with outboard motors and head upstream to the Amazon Villa. All our boats are 20 foot long, roofed canoes with four strokes outboard motors. The three-hour boat ride is pleasant and often includes our first sightings of macaws, heron, caiman and capybara. Once the boat arrives at the lodge dock, you will have officially arrived at the wild rainforests of Tambopata! We do not travel by boat in the dark, so we spend our first night at Refugio Amazonas. Early next morning you will depart for the four-hour boat ride to Tambopata Research Center. One and a half hours into the ride, you enter the uninhabited, pristine nucleus of the Tambopata National Reserve and prime jaguar territory! Day 2 – A la Carte Activities. Day 3 – A la Carte Activities. Day 4 – Departure to Puerto Maldonado Airport. After breakfast. Transfer Puerto Maldonado Headquarters to Airport. We retrace our river and road journey back to Puerto Maldonado, our office and the airport. Depending on airline schedules, this may require dawn departures. NEW – 300 Mts of Elevated Walkways: Located in the perfect level of the forest where wildlife become more active. Two Macaw Claylicks: A trip to the Tambopata Research Centre includes a visit to the two most important clay licks in the region: Colorado and Chuncho. Visit these special portions of river bank while Macaws and parrots make a raucous and colourful spectacle which inspired a National Geographic cover story. AmazonCam Tambopata: We are building a Big Grid to answer Big Questions thru the AmazonCam Tambopata. Become a researcher and explore the world of camera traps and the amazing wildlife they reveal’ it’s a Big Neighborhood! Herds of White-Lipped Peccaries: Tambopata Research Centers’ location inside a huge and pristine rainforest means peccaries roam at carrying capacity. Herds of one hundred or more individuals visit the lodge garden frequently to gather nuts from its palm trees. Macaw Research and Conservation: Since 1989, researchers have been carrying out groundbreaking macaw conservation research from TRC. During your stay, you will likely have the chance to talk with macaw biologists, ecologists and other experts while they do fieldwork. Canopy Tower: During your stopover at Refugio Amazonas (see How to Get To Tambopata Research Center) you will be able to climb the 30-meter scaffolding tower for expansive views of the rainforest and sightings of colourful toucans and parrots against a green backdrop. Discover a New Species: Join a Wired Amazon team member and help him collect insects at the light trap that will be genetically sequenced. Every month, a lucky guest discovers a new tiger-moth, scorpion-wasp, caddisfly or treehopper species that are new to science! Rainforest by night: Walking through the rainforest at night challenges all your senses. In deep darkness, surrounded by an array of jungle sounds and with the aid of your guide’s powerful spotlight, you enter a world inhabited by the most unique, diverse and shy night creatures. 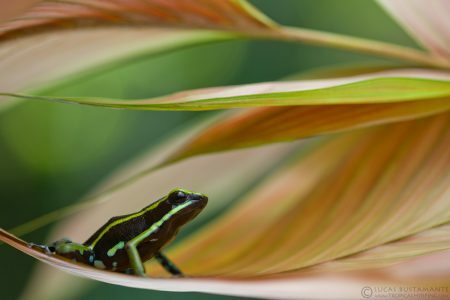 If fortunate, you will be able to find poison dart frogs, night monkeys, tarantulas, amphibians and insects with the most unique adaptations to life under the cover of darkness. Parakeet clay lick: A fifteen-minute boat ride and sixty-minute hike from Refugio Amazonas will take us to a completely different clay lick used both by parrots and parakeets. We will watch from a blind as parrots and parakeets descend to ingest the clay on a bank. Aerobotany: Aerobotany is where centuries-old classic field biology and 21st-century cutting-edge technology come together, in the middle of the spectacularly diverse and underexplored Amazon rainforest. Join our resident aerobotanist to fly drones over the canopy and classify the photos. Overlook Trail: This 2 km trail will take us along the Tambopata River for a great overview. We will show you the differences of a terra firme forest and a secondary forest after passing through both habitats. We will also take breaks at benches that help us witness the Tambopata on its journey through the Amazonian lowlands. Ethnobotanical Walk: During a short walk near Refugio Amazonas, you will discover the relationship between local people and plants. Plants are incorporated into the daily lives of local people as food, medicine, clothing and also used as building materials! Interpretive guides lead this walk. Ceiba Hike: Trees in the Peruvian rainforest can be pretty impressive. A hike through the rainforests around Posada Amazonas and Refugio Amazonas will take you past massive Brazil Nut trees that are 120 feet (40 meters) tall. You will walk past 500 year old Ironwood trees with huge trunks and massive branches used as nesting sites by macaws. You will feel dwarfed by old growth trees with a canopy so tall that birds and other animals are naturally hidden from the ground because they are simply too high up to watch without a telescope! Palm Swamp Trail: Nature tours to Peru that visit the Tambopata Research Center (TRC) get the chance to experience one of the most remote and wildest areas in the country. 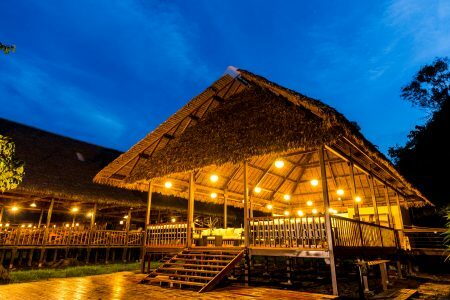 The lodge itself is situated in beautiful, untouched floodplain rainforests that host healthy populations of Amazonian Tapirs, Jaguars, and seven species of monkeys. Six species of macaws abound, are often seen right around the lodge, and can show up in large numbers at a nearby clay lick that attracts thousands of parrots and parakeets and has been featured in National Geographic. Several kilometres of trails provide access to bamboo thickets, beautiful primary rainforest, and even a small oxbow lake frequented by piranhas and Spectacled Caimans. 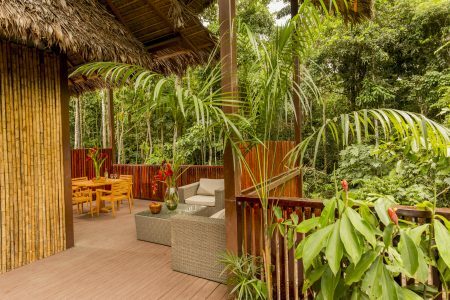 Brazil Trail Nut and Camp: Refugio Amazonas is located in a Brazil Nut forest. This hike is a beautiful old growth patch of Brazil Nut forest that has been harvested for decades (if not centuries) where the remains of a camp used two months a year by Brazil Nut gatherers can still be experienced. We will demonstrate the whole process of the rain forest’s only sustainably harvested product from collection through transportation, drying, and on to the products we consume. This hike takes about 2.5 hours. Mammal Clay Lick: Twenty minutes walking from Refugio Amazonas is a peccary clay lick. These wild rain forest pigs show up in herds of five to twenty individuals to eat clay in the late morning. Other wildlife also shows up including deer, guan and parakeets. Chances of spotting them are low but well worth the short hike because we also will have fun camera traps! Overlook Trail: This 2 km trail will take us along the Tambopata River for a great overview. We will show you the differences between a terra firme forest and a secondary forest after passing through both habitats. We will also take breaks at benches that help us witness the Tambopata on its journey through the Amazonian lowlands. Monkey Walk: The tall rainforests closer to the river are known as floodplain forests. This route is known as The Monkey Walk, because of its goods possibilities to see Spider monkeys, Red Howler monkeys and Brown capuchin monkeys among other. These rainforests are subject to various degrees of flooding during the rainy season and on account of the rich nutrients left by the river, they have a high degree of diversity and immense trees. Although trails at those lodges access floodplain forest, the best place to experience it is at the Tambopata Research Center (TRC). Terra Firme Trail: The Tambopata Research Center (TRC) is situated near the river of the same name in a rich and beautiful type of rainforest known as “floodplain forest”. An extensive network of trails provides access to this wild habitat and guests on Amazon tours who hike on them frequently see Spider Monkeys, Brown Capuchins, and big troops of Squirrel Monkeys. Giant Armadillos are also occasionally seen as are big herds of White-lipped Peccaries and scores of beautiful, rainforest birds. As exciting as the trails through floodplain forest are, TRC also has trails that pass through bamboo groves and Terra Firme forest. Sunset Cruise: Sunsets in the jungle are one of nature’s most beautiful spectacles, and one of the best places to enjoy them is from a boat on the Tambopata River. In the afternoon, your guide will take you to a boat for an easy-going, 45 minutes ride on the Tambopata. Your guide will talk about the dynamics of this Amazonian river as you watch for rainforest wildlife and see macaws fly overhead before enjoying the jungle sunset. Jungle Farm Visit: Visit a working jungle farm and a real Brazil nut concession to learn about the way of life in the rainforest. You will taste exotic tropical fruits and discover medicinal plants from the neighbouring local families that we are helping integrate into the ecotourism industry. Oxbow Lake Visit: Paddle around the Lake Condenado on a catamaran, looking for wildlife such a hoatzin, caiman or horned screamers. 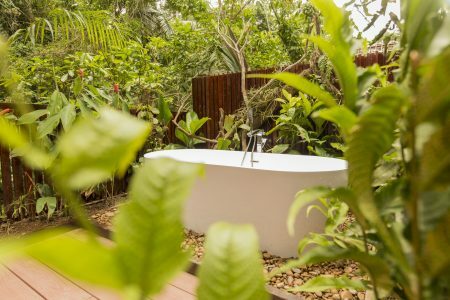 Natural Construction Rooms: Bedrooms open out onto the surrounding rainforest, allowing you to enjoy this diverse ecosystem even during downtime, with wild animals, including monkeys, often visible from the lodge. The dining room is a huge open building with a loft on the second story for an eye-level view of the surrounding rainforest canopy. Children´s Rainforest Trail: Your kids can enjoy the Amazon´s only trail for children and a playground beside the lodge. 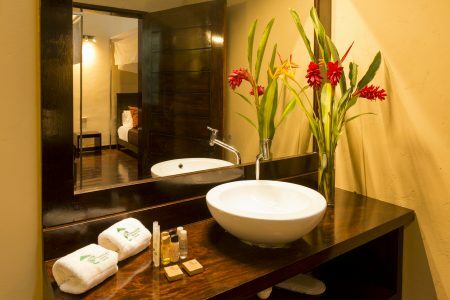 Wellness Center: Enjoy massages and aromatherapy at our wellness centre. Fixed departures transfer from Puerto Maldonado Airport to Tambopata Research Center: land and river transportation. International and internal flights and Airport taxes. Alcoholic beverages or bottled water & snack.